The nation’s top Spanish-language TV network, Univision, will launch a new cable venture today with ABC News called Fusion, aimed at an audience of young Latinos (and other millennials)—but in English. The network will include a mix of entertainment, sports and news, including new shows by Jorge Ramos, a well-known news anchor for Univision’s Noticiero Univision and Alicia Menendez, daughter of Sen. Robert Menendez (D-N.J.), and a former journalist from the Huffington Post. Univision has been on a growth trajectory that many of its English-language peers would love to emulate. In July, it finished first among all broadcast networks in TV’s highly-sought-after 18-to-49-year old and 18-to-34-year old demographic groups. But since then, its ratings among those groups have declined, according to Nielsen. Fusion’s launch reflects several demographic trends among the nation’s 53 million Hispanics, who make up 17% of all Americans. 1. The Latino population’s growth is now driven by the children and grandchildren of immigrants. This has been true since 2000 and has started to change the composition of the Latino population as the share foreign born has begun to decline. For example, among Latinos younger than 18, 93% were born in the U.S.
2. 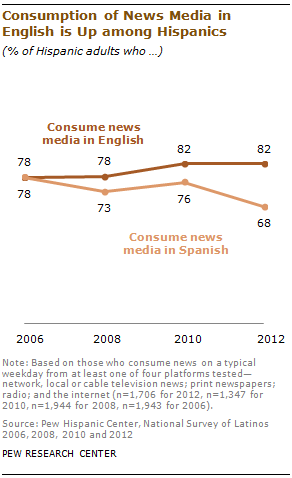 When it comes to news consumption, a growing share of Latinos prefers English. 3. Among young Latinos who rely on television for news, Spanish is on the decline. A new analysis of a 2012 Pew Research Center survey of Latino adults finds that fully 90% of Latinos ages 18 to 29 who get their news from television do so in English. When it comes to other forms of entertainment, such as television and music, use of English is higher among younger Latinos. 4. 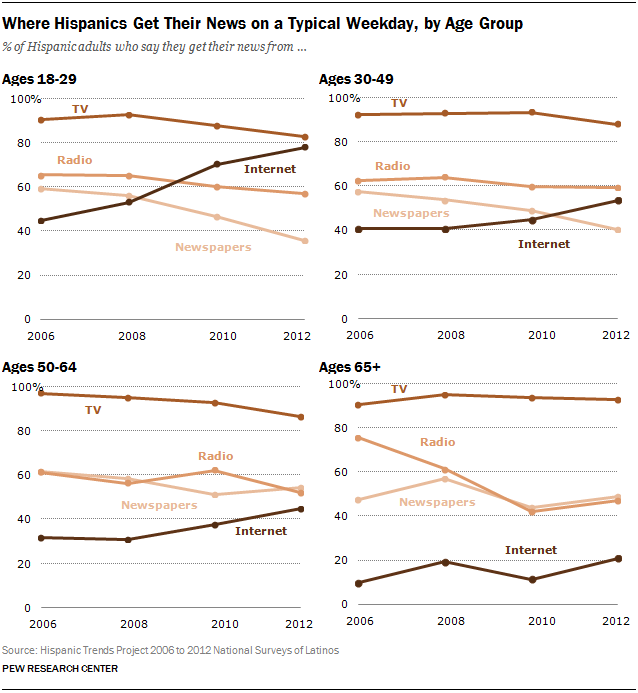 Having said that, television as a news media platform is declining among young Latinos. Already, a growing share of young Latinos, just like other young people, is getting news from the internet, and fewer are doing so from television, according to the new Pew Research analysis of 2012 data. Nonetheless, television remains a key source of information for young Latinos. 5. A growing share of Hispanic households speaks only English at home. Overall, the number of Hispanics (31 million) that speaks English has been growing, as is the share that speaks only English at home. 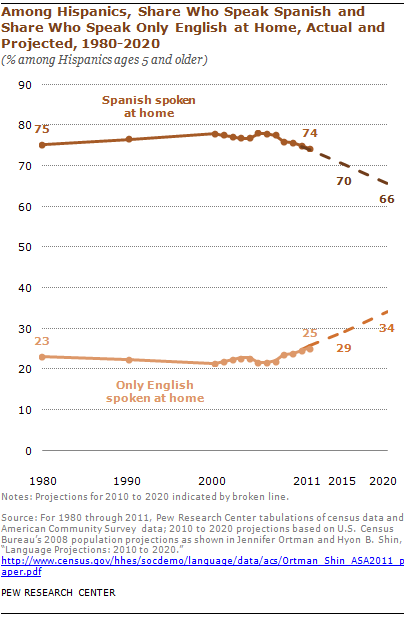 U.S. Census Bureau projections show that by 2020, one-third of Hispanics ages 5 and older will speak only English at home, up from 25% today.